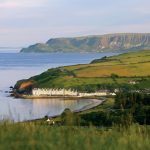 Self catering holiday accommodation Cushendall Glens of Antrim. Ballymacdoe Cottage Cushendall offers self-catering accommodation. Provided: Free Wi-Fi, TV, patio and free parking. Kitchen: dishwasher, microwave, dryer, oven, fridge freezer and dishwasher. Bathroom: bath, shower toilet wash hand basin. Enjoy a sea and mountain view. A garden with barbecue facilities. We would love to have you come and stay at Ballymacdoe Cottage to relax and experience the beautiful surroundings of the North Coast. The cottage is just an hour’s drive from Larne ferry port and 30 miles from Belfast International Airport. It is centrally located in a quiet residential area in the pretty village of Cushendall. 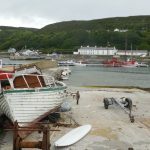 Situated on elevated ground overlooking Cushendall beach and golf course with breathtaking sea views of Red Bay, Sea of Moyle and Scotland is clear in the distance. The cottage has a ground floor only, no stairs. The accommodation consists of a Lounge & diner, kitchen, bathroom with shower. Three bedrooms, the largest room has king size bed, second bedroom has two singles and the final room has adult bunk beds consisting of a double at its base and a single above, hence the cottage can accommodate six people. Electricity and oil central heating included, open fire with fuel supplied, linen and towels included, cot, high chair, satellite tv & radio, washing machine, dryer, fridge freezer, microwave, gas cooker, dishwasher, hairdryer, welcome pack, fully enclosed garden, garden furniture, BBQ, off road parking, small pets welcome for an extra fee. It is an ideal location for walking, fishing, sailing, touring or just having a relaxing time with friends and family. The cottage interior provides a cosy comfortable stay with stunning views creating a warm and welcoming atmosphere.